My friend and our aquatics coach, Bill, is a triathlete coach. His business is named the Ultimate Athlete. Until today I thought it was a very catchy name that described the very fit people that he works with. These folks do boot camps, crazy training methods, like jumping off White Street Pier with a 10 pound medicine ball and swimming! Today I met the Ultimate Athlete, the one that I work so hard to give a voice to. 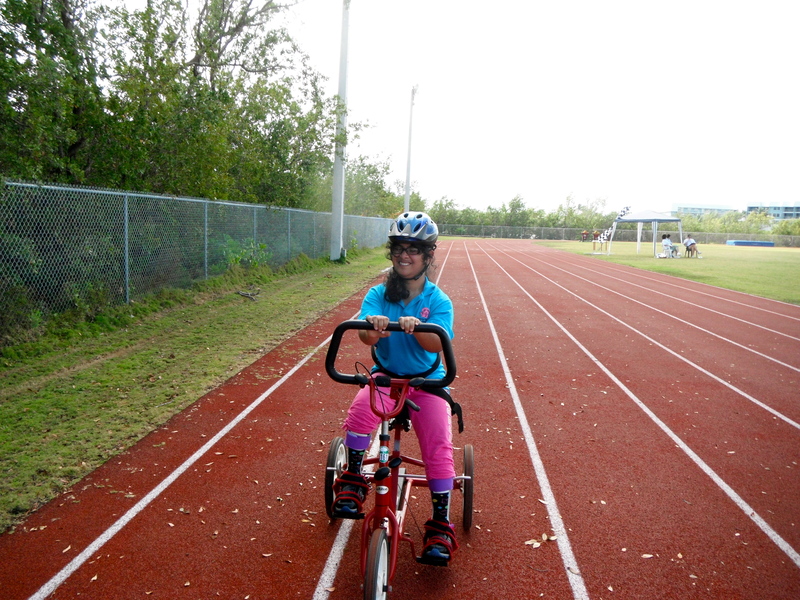 This little gal spent the entire time of the competition peddling around the high school track. She persevered and pushed her feet against those peddles as others were flying by her! Multiple heats and races took place as she peddled on to her finish line. Upon arriving at the finish, all activity stopped and in true Special Olympic fashion we all cheered and she smiled so big as all the coaches cried. This is why we do what we do!